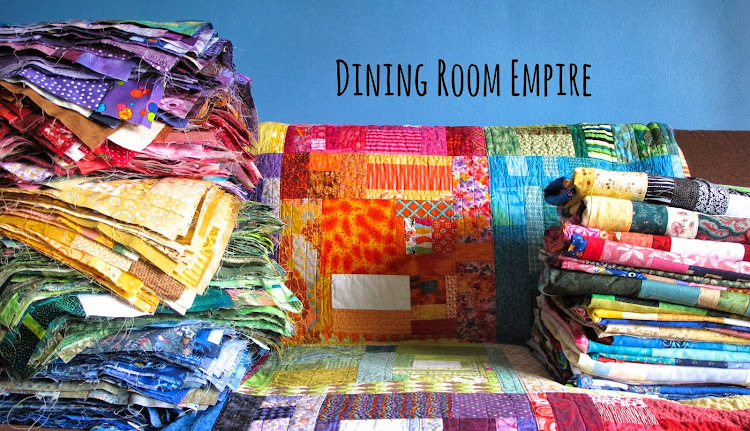 Dining Room Empire: It Got Bigger?! Last week my Mom asked me how I was doing with respect to my giant WIP/UFO list. I had to stop and think before I answered her. Rather, not answer her. I couldn't really recall if I'd finished much or at least moved on. Needless to say, I thought I better investigate and give an update. 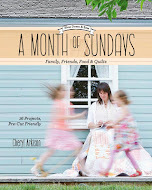 If not for you, Mom, then to keep me on track! 1. Cosmos Blocks - once I make a back for it I'm giving it to Andrea for quilting. 6. There is Peace in Pattern - top made, backing fabric purchased, waiting for basting. 8. 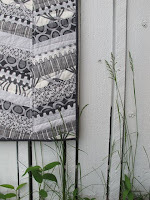 Anniversary Quilt - It is the next one on the list for quilting. 9. 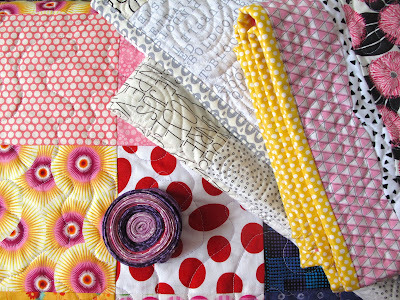 Low Volume Circles - I'm plugging away on the hand quilting, slowly. 26. A travelling quilts project that just started. I've got the first round waiting for my input. 37. I know there is a box of 2000 2 1/2'' squares sitting in my garage somewhere. If the mice haven't got to it I'll have to tackle those when they are found. 38. and 39. I have two ongoing scrap/leader and ender projects. They aren't coming together as much yet, but I must admit to them. Plus 1 more I can't share for another week or two and my daughter's quilt we made together (That's it waiting for binding up there.) Boy, and I was excited that I got two quilts finished this past week. Oy. I was so happy to see your WIP list! I am going to share it with my husband, who thinks I should stop buying fabric until I finish my four WIPs. Having just started quilting a few months ago after buying your book, I've tried explaining to him that I've got to continually build my stash. And, besides, I've finished two quilts, and only have some hand sewing on the binding on one of the WIPs. He's not buying it. 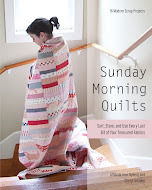 I absolutely LOVE Sunday Morning Quilts, and check your and Amanda Jean's blogs daily for new posts. Such inspiration! Thank you! Wow that is a big list. I am sure my list is longer but I do not want to know. My UFO list now only has stuff I plan to finish. I have a few old class projects that will never be finished. I may give some way or redo them in some way. I have given away old UFO before. I should make the list and see how bad it is. oh my that is some list you have going! I have slowly whiddled my list down to one quilt to be quilted, my oldest UFO. Isn't it just a sign of a true artist to have so many artworks in progress? Go Cheryl, Go! Finishing feels great! I'm soooo glad to know someone else has a list as long as mine. I think it's because we are all bursting at the seams with creative ideas that we simply don't have time to get it all finished. For every finish there must be at least 10 new ideas right? Thanks for sharing because it really does inspire me to get going . . . especially today. Did you know that you can shorten your long urls with AdFly and earn $$$$ from every click on your shortened links.